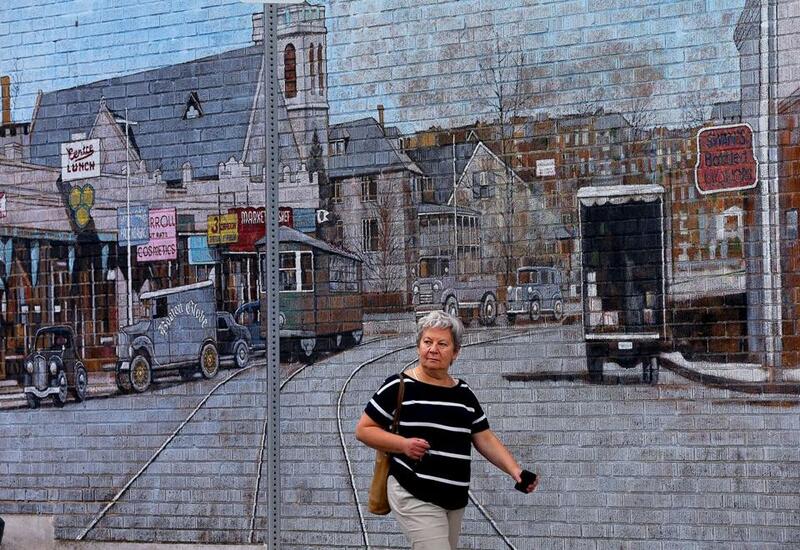 A woman walked past a mural depicting and old view of Centre Street on May 26. There’s a new generation of neighborhood advocates bubbling up in the Boston area — people who realize that protecting a place means accepting growth there. For these “yes in my back yard” types to make a difference, they need to organize and speak out, instead of just grumbling about NIMBYs to their Facebook friends. Meet Matt Gruber. He’s the current treasurer and past president of West Roxbury Main Streets, the organization tasked with sprucing up the commercial strip along Centre Street. West Roxbury’s reputation is as a suburban Eden within Boston, an enclave undisturbed by the construction cranes downtown. But it, like every square foot of the Boston area, is subject to economic forces that it doesn’t control. Gruber knows that, as housing costs rise, and people flock to walkable dining and shopping districts, communities can’t just wish those pressures away. In Massachusetts, we treat disputes over storefronts and condo projects as the most local of local matters. As the legislative session draws to a close, a bill to reform zoning rules statewide to promote more housing construction looks doomed. If you’re worried about being priced out of Greater Boston, or about widening levels of inequality in Massachusetts, you should be rooting for advocates like Gruber as they try to change minds one neighborhood at a time. Otherwise, things will keep going down like this: In West Roxbury, on the single block of LaGrange Street that stands between a commuter rail stop and Centre Street, there’s a decrepit old factory that’s been an eyesore for years. It’s a prime site for a bold mixed-use project. The apartment complex that a developer proposed was more sedate. Yet as neighbors complained of parking, traffic, and an influx of transients, the project turned into a condo building and shrank from 62 units to 48, and then to 40. But the Zoning Board of Appeals still voted it down in April, because — well, there’s always something. That vote won’t stop anyone from wanting to buy in West Roxbury. There’ll just be fewer units to absorb the demand. In a different spirit, West Roxbury Main Streets enlisted the Metropolitan Area Planning Council to help assess what neighborhood residents as a whole want and need. Instead of countless public meetings that are difficult for parents with jobs to attend, there was a one-day “visioning session” on a Saturday in June. Instead of relying on anecdotes about what residents want, the group set up a survey that drew 700 responses and showed strong support for a pedestrian-oriented commercial district, a more eclectic mix of businesses, and broader housing options. Throughout Eastern Massachusetts, existing block-by-block limits on growth add up to something perverse. As a startling report showed earlier this year, the City of Somerville has banned, well, Somerville. Exactly 22 of the existing residential buildings in that community of 80,000 people would be legal under today’s zoning rules. Lots of cities and towns have passed similar limits at the request of neighborhood leaders. The underlying message is: We’ve got ours, so who cares if house prices go up? Fortunately, contrary voices are emerging. In Newton, a coalition that formed to support one mixed-use project on a grim city-owned parking lot is reinventing itself as Livable Newton. An organization called A Better Cambridge snapped into action when some residents of the Riverside neighborhood asked the city for tougher zoning rules there. Grass-roots pro-growth groups around the country are learning from one another. A Better Cambridge founder Jesse Kanson-Benanav, who works in affordable housing, attended a recent “yes in my back yard” conference in Boulder, Colo., where participants traded suggestions about how to encourage denser, transit-friendly development. Many of the YIMBYs whom I’ve met have one thing in common: They came to their communities by choice rather than by birth. Kanson-Benanav, for instance, is from Minnesota. Gruber’s not-from-here accent is still strong enough that he says “yada yada yada” in non-“Seinfeld” contexts. That’s a positive. While lifelong residents have wisdom to impart, so do newer arrivals who see a place only as it is now, not through the lens of what it used to be. For a nightmare version of Boston’s future, look west. Because San Francisco and other Bay Area communities didn’t build enough to absorb a rapid influx of tech workers, growth-averse residents have awoken to find once-affordable neighborhoods transformed right out from under them. They’ve resorted to nutty ballot initiatives that try to turn back the clock and defy the law of supply and demand.